Laugh out loud funny, a good light read. The story is an insight into the difficulties faced by many families and the struggles that come with age. Mostly told through direct speech and little authorial intrusion. Marina Lewycka introduces her characters slowly, unraveling mysteries and flaws with stories of the past. Description is not what makes it unusual. Although the novel is mostly seen through the eyes of one character, actions and decisions taken by other characters and how they are revealed make up a large part in how the reader judges the characters. 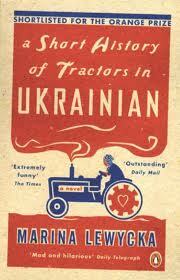 I particularly enjoyed the way the plot breaks with snippets of detail and history about tractors in Ukraine, a book that one of the characters writes. The novel within a novel, mise-en-abime, technique works really well with the main plot. 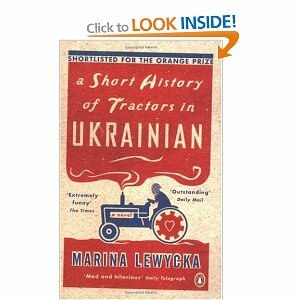 The differences of the two stories highlighting the vast differences in society and between the two cultures: Ukrainian and British. The plot would make for an excellent script of a play as I think there is strengh in the story and characters to entertain and educate an audience. A good novel if you are looking for something different. Not your average classic love story or war history novel. "Weddings like funerals, provide the perfect arena for family drama: there are the rituals, symbolic costumes, and every opportunity for snobbery in its many guises."